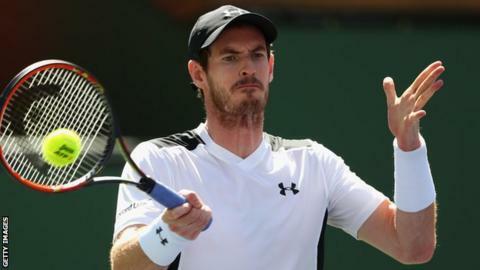 Andy Murray made an early exit from the BNP Paribas Open in Indian Wells with a surprise loss to Argentine world number 53 Federico Delbonis. The British number one, playing his first ATP tournament since becoming a father last month, was beaten 6-4 4-6 7-6 (7-3) in the third round. The Scot, 28, was well short of his best, squandering a 4-1 third-set lead before losing the decisive tie-break. Johanna Konta progressed in the women's draw by beating Denisa Allertova. Konta, seeded 25, was a 6-4 6-1 winner over her Czech rival, who had beaten Australian Open champion Angelique Kerber in the previous round. The Briton, 24, broke Allertova's serve in the fifth game of the opening set before taking full control in a dominant display. "I fought the hardest I could fight and took some opportunities when I got them," said Konta. She will next face Czech Karolina Pliskova, who defeated Ana Ivanovic 6-2 6-0. The world number two said he struggled with his serve in windy conditions: "I didn't serve one ace in two hours and 45 minutes of a match. "I have the capability of serving over 130 miles an hour and I was at probably 100, 105 miles an hour average first serve speed which was way too low. "I just struggle in these conditions. I don't know why it is. The reason why I'm not going for my serve is I feel that when I do, I miss it. "It's a slight mentality thing, but I seem to do it here every single year. It's frustrating because I don't serve at that speed the rest of the year." "Close followers of Murray's desert fortunes have seen similar performances in the past, but, from 4-1 up in the deciding set, the world number two knows he should have comfortably sewn things up. "The drop shot, with which Murray has thrilled and frustrated in equal measure over the years, was overused in the closing stages - a sign of Murray's lack of confidence from the back of the court in these unique conditions. "The ball flies through the desert air and can bounce up quite high - different conditions to Miami, where Murray will be heading for his next challenge."